CANBERRA—Australian parliamentarians from major political parties have officially joined forces for the first time to address the pressing issue of forced organ harvesting and transplant tourism. The newly-formed Parliamentary friendship group—Parliamentarians Against Forced Organ Harvesting (PAFOH)—held their first meeting in Canberra on July 16. The group was officially registered in Parliament in 2013. According to the Australian Parliament website, the purpose of the group is to raise awareness among Parliamentarians of the issue of forced organ harvesting and transplant tourism across the world. “There is no way that you can condone the practice of killing people for their organs in any way, shape or form,” said Senator John Madigan, Co-Chair of PAFOH, from the Democratic Labor Party (DLP). PAFOH is currently listed on the official Parliamentary register. More than 10 politicians have joined, including MPs from the governing Liberal Party, Opposition Labor, as well as the Democratic Labor Party (DLP) and independent MPs. “The practice of forced organ harvesting in countries including China should not be ignored under any circumstances,” said Senator Madigan. The co-chair of PAFOH from the governing Liberal Party, Craig Kelly, said he was motivated to join the group to address both the criminal organ harvesting overseas, as well as increase the rates of donation in Australia. “If we were able to lift the rate of organ donation in Australia and also worldwide, the barbaric practice of forced organ harvesting would come to an end,” said Mr Kelly. The PAFOH meeting was followed by a formal Senate address from Senator Madigan. “I wish to put on the record that the practice of forced organ harvesting in countries, including China, should not be ignored under any circumstances. I and the DLP believe that all should have the freedom to practise their religion without fear or favour,” said Senator Madigan, during the Senate sitting. 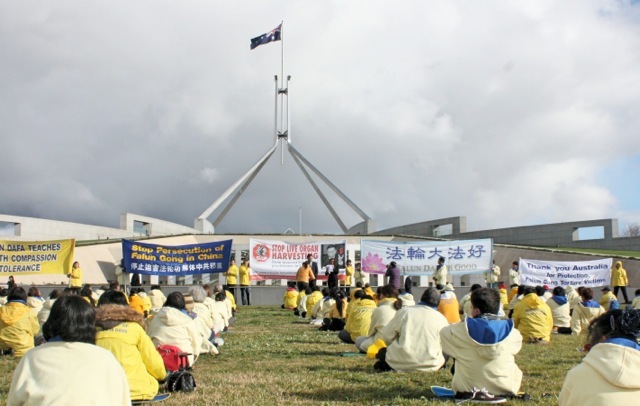 He acknowledged the over 400 Australian Falun Gong practitioners who had gathered in Canberra on the day to commemorate 15 years of persecution of the practice in China. The spiritual discipline has been under harsh repression since July 20, 1999 and its adherents say practitioners in China have been one of the main sources of organs. The matter was also acknowledged by Labor Senator Claire Moore and Greens Senator Scott Ludlam, who both expressed the importance of the contribution of Senator Madigan in terms of addressing the human rights concerns of Falun Gong and noting the vast number of practitioners in the Senate gallery . Demand for organs around the world, including Australia, has been on the rise, while the supply continues to fall short. According to the Global Observatory on Donation and Transplantation report, an estimated 114,690 solid organ transplants were performed in 2012 . Spain, with its opt-out organ donation system, leads the world with the number of voluntary donations, with 35 people going on the official register per 1 million population. In the US, 21 citizens donate per million, and in Australia, just 16. Meanwhile, the World Health Organisation conservatively estimates illegal organ trades comprise approximately 10 per cent of this global transplant activity. Illegal trade brings profits of up to $US1.2 billion annually, according to the non-Government organisation Global Financial Integrity. However, in countries like China, which performs the second largest number of transplants in the world, second only to the US, the voluntary donation rates were negligible and only because the China Red Cross Society pays a high premium to patients on their death bed have those organs recently been acknowledged as voluntary organ donations. According to Chinese Ministry of Health statistics, at least 10,000 transplants take place in China annually. “This raises important questions as to where the rest of the organs come from,” said medical Professor Maria Fiatarone Singh from Sydney University. Professor Fiatarone Singh gave an in-depth presentation about the ethics and social responsibility at the PAFOH meeting in Canberra. According to a 1984 Chinese law, it is permitted to remove organs from executed prisoners. Since the 1990s, claims have been made that organs were systematically harvested from executed prisoners. Ethan Gutmann, an award-winning China analyst and human-rights investigator, presented new findings from his latest publication. Via a video conference call, he provided a brief outline of organ harvesting in China. He estimated there had been “65,000 Falun Gong murdered for their organs by 2008.” Furthermore he quoted that “figures up to 2 million [dollars are] being paid by certain patients for organs. For the first time, Mr Gutmann said, his new book will release “a surgeon’s ‘smoking gun’ testimony” providing critical evidence about organ harvesting. The name of the surgeon has been embargoed with the release of his new book, The Slaughter. For years, Beijing denied these allegations repeatedly. In 2005, China Daily reported the number of transplants in China to be about 20,000, with more than 90 per cent of the organs coming from executed prisoners. At a 2010 Madrid transplant conference, former Vice-Minister of Health Huang Jiefu reiterated that over 90 per cent of the organs from deceased donors originate from executed prisoners. He expressed his support for the organ procurement from executed prisoners in a 2013 ABC 7.30 Report interview. “I have no objections to using executed prisoners organ donations if he or she has freely demonstrated that that is his last will,” said Huang. Leading medical bodies, like the World Medical Association and The Transplantation Society, condemn the use of prisoners as an organ source due to the lack of freedom as a precondition to provide voluntary, free consent. While promises of “phasing out” reliance on prisoners have circulated since 2007, prior to the Beijing Olympics, it appears China has backflipped on its promises. Recent announcements by Huang, now the Director of the National Organ Transplant Committee, suggest that prisoners’ organ details will simply be integrated into the new computerised allocation system. “Any organ donations, including those by executed prisoners, have to go through the system and the computerised allocation process,” said Huang, in an article from China Daily. However, the computerised allocation process only ensures fair allocation, but will continue to use prisoners’ organs. Professor Fiatarone Singh says this will simply mean that it will become impossible to trace organ origins and gives no guarantees of stopping the unethical practice.